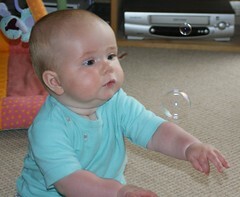 Anna and Amaia's blog: Bubbles! This is the weirdest ball I've ever seen mum. How did you make it out of thin air? I'm sure if I just concentrate hard enough I'll be able to catch it with my hand... oops POP! Where did it go??? ?